Anniversario di uno dei pochi Vescovi validamente consacrati nel mondo. In tutto possiamo stimarne un centinaio. Essi garantiscono la continuità apostolica, quindi l’indefettibilità della Chiesa. Celebrate Bp. Dolan’s Anniversary with Us! 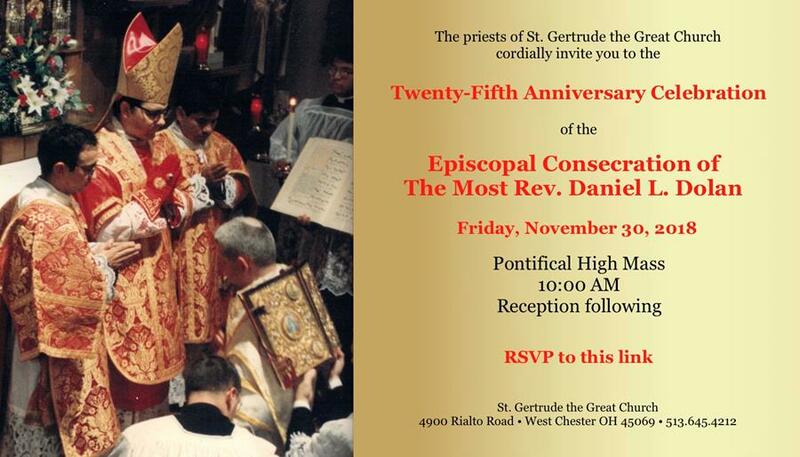 On the Feast of St. Andrew, November 30, 2018, we will be celebrating the 25th Anniversary of the Episcopal Consecration of the Most Rev. Daniel L. Dolan. The celebration will include Pontifical High Mass at 10:00 AM, followed by a reception in the parish hall. If you wish to attend, please sign up using the link below, so that we can have an accurate count for the reception following. If you are not able to attend, you may view the Pontifical Mass via the SGGResources live webcast site, and join your prayers of thanksgiving at home to ours. Questo articolo é stato pubblicato 30 ottobre 2018, 13:05 ed é archiviato sotto Attualità, Cattolicesimo. Resta aggiornato attraverso il feed RSS 2.0. Puoi lasciare un commento oppure inviare un trackback dal tuo sito.